These are our favorite ornaments. What a great way to save the hospital baby hat and hospital bracelets. Every year I decorate the tree I am reminded of the most special days of my life, the births of my three babies. 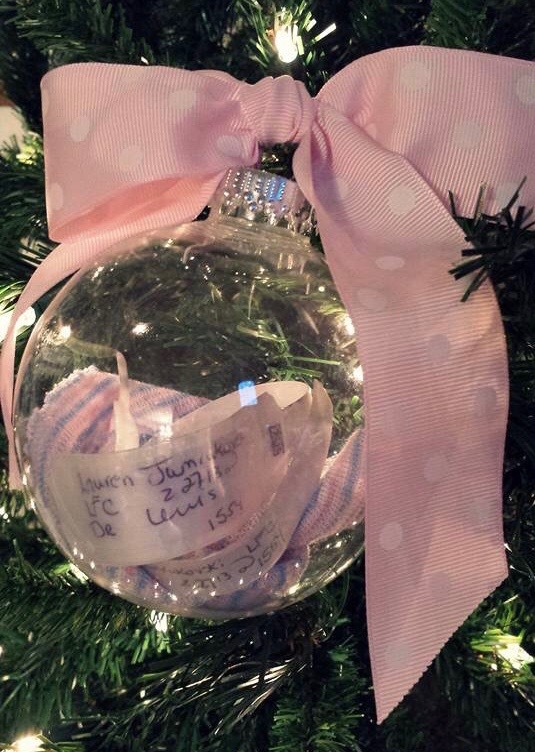 To make this ornament, simply place the baby hospital hat and mom and baby’s hospital bracelets into a clear ornament. We chose plastic, so we didn’t have to worry about it breaking. Here is a clear plastic ornament which is four inches across. In this ornament, the opening is in the top, so we had to roll the items up tight to stuff them in. You may prefer an ornament which opens at the center such as this one. This option is a little smaller at about three inches across. To finish it off, we added our favorite ribbon to the top. For this craft, we bought a plain red ornament. 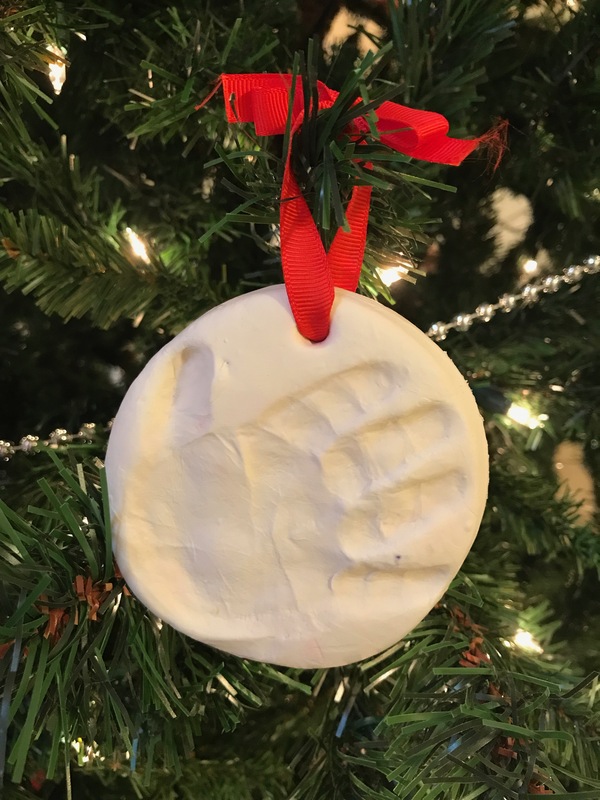 I painted my daughter’s hand with non-toxic white paint (we used Crayola Washable Paint) and had her grab the bottom of the ornament like she was grabbing a ball. Each of the snowmen are her little fingers. We could not get her thumb to look like a snowman, so we kind of blotted it into the bottom a little to make it look like snow. I just used her hand to blot, but you could use a sponge. We used sharpie markers to make the snowmen features and also to write the date and child’s name on the bottom. This ornament was inspired by a gift from a friend on the Christmas following our wedding. We cherish this ornament and have since started making them for friends and family. I prefer using a plastic ornament which does not open at the center, such as these. This way, it won’t break open. Cut the invitation up into long strips. I usually throw out the solid parts and keep any sections which include words or decorations. Wrap the long pieces around a pencil tightly, so they form a spiral. I try to wrap it moving down the pencil a bit rather than overlapping it in one single spot. When you let go, they should keep the spiral shape you see in the photo above. Slide each spiral into the ornament and shake it around. Add your favorite bow to the top. 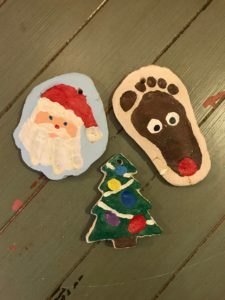 Salt dough ornaments are so fun to make. The kids love it, because they can play with the dough just like play dough. Once you make your creations, poke a hole at the top with a straw for hanging on the tree. Then, bake at 200 degrees for 3 hours. You want to be sure the ornaments are dried all the way through. If they are still soft on the back, you may want to flip them over for a bit longer (once the top is set). Next, you will paint your objects. I like to use acrylic paint. Last, spray your ornaments with an acrylic sealer to help them last. You will use an upside down handprint. Have your child push their hand onto the dough. Trim the dough around the hand shape leaving enough room to poke a hole with a straw. The hole will go at the base of the handprint. The thumb becomes the Santa hat. The fingers become the beard. Have your child push their foot into the dough. Tim the excess and poke a hole about the toe area. Paint the whole foot brown, except for the eyes in the center and the red nose at the bottom. Cut out a Christmas tree shape, or use a cookie cutter. Poke a hole in the top. Have your child make fingerprints throughout the tree. The finger prints will become the ornaments. Paint the “ornaments” so they stand out. For this ornament, we bought a kit which made it super easy. We like the no-bake Pearhead kit. We made one of these for each of our children. It was so funny to see how big my newest daughter’s hand is compared to my other kids at the same age. There is nothing better than seeing your baby’s real handprint each and every Christmas. 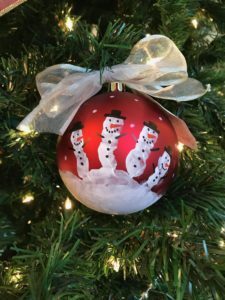 To make a yearly time capsule, you can place all of your special items you want to save into a large ornament throughout the year. You could include small photos, ticket stubs, little drawings, anything which means something to the family. You can even type or write out memories and place them inside. A variation of this ornament was shared with me by a fellow mother and member of my MOPS group. She shared the idea of adding one milestone that each of your children met into the same ornament each year. 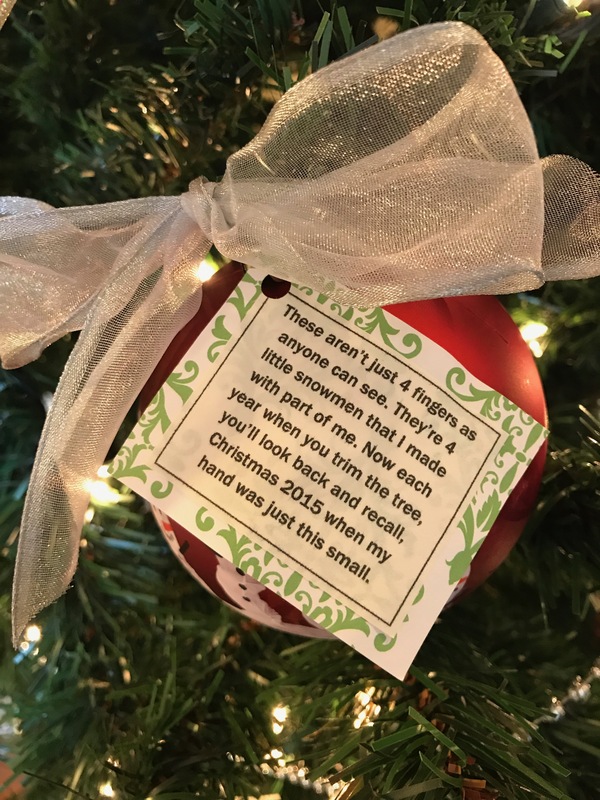 You simply write out something important each of your children accomplished that year, date it, and add it into the ornament. For babies, it may be crawling, but for an older child it may be making a sports team. One day, you can open up the ornament and look back at all of the amazing accomplishments through the years. 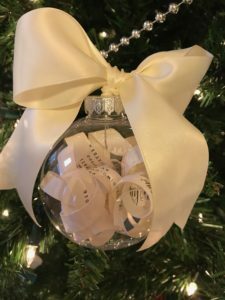 I hope you will enjoy making some ornament keepsakes this year! 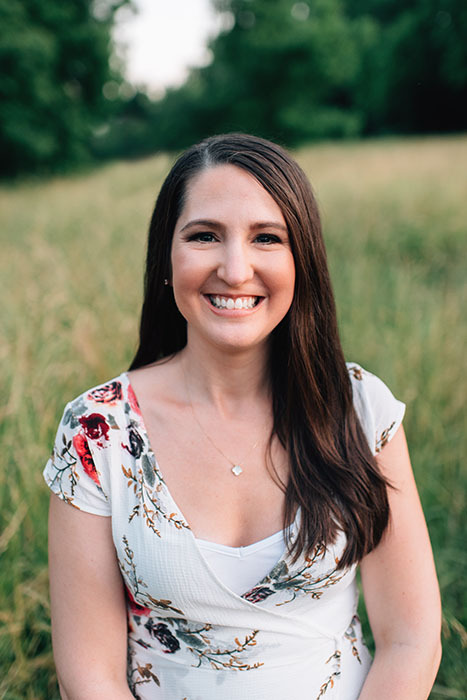 You can count on me only recommending products which I know and love! 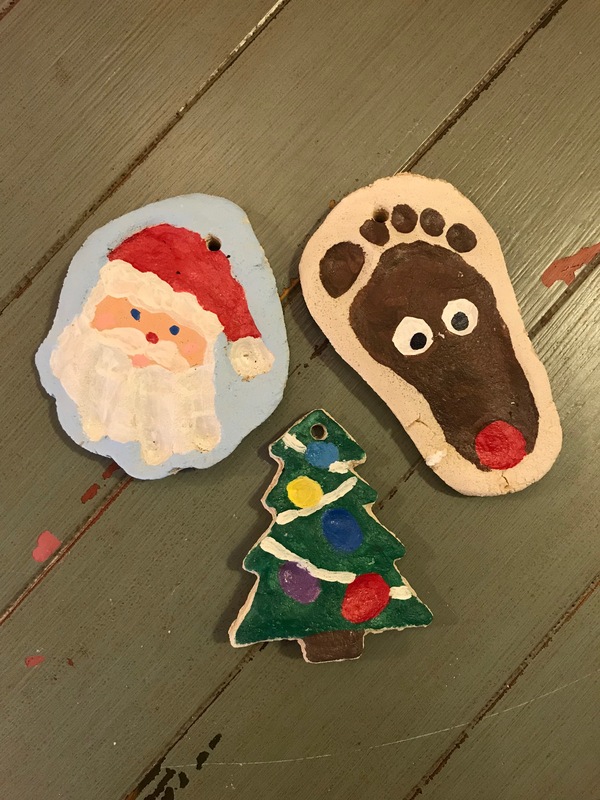 I have done the salt dough ornaments but I never thought to put the kids hospital bracelets in the ornaments, such a great idea:) Thanks for the post. Hi Mary! We love salt dough! Such a fun tradition. You are so welcome. I am glad you enjoyed the idea! This all looks great and doable. I love how you can keep the memories in such a creative way. Will try some of it with my toddler . Thanks for sharing. Hi Nessly! Thank you so much for your kind words! I am so happy you found some ornaments to try with your toddler! Very cute! My daughters school did the snowman one and I love it. Hi Stacy! Thank you so much! That is such a sweet gift from school. We love ours so much!